Argentina‘s second largest city (pop. 1.3 million) is definitely a change of pace from Buenos Aires. While the country’s capital impresses with its imposing buildings and the pace and trappings of a major world city, Córdoba, smack in the centre of the country some 700 kilometres (435 miles) northwest of B.A., does so in a gentler, more laid-back way, with colonial elegance and provincial charm. One of the architectural centerpieces of the city’s historic core (est. 1573), the so-called Manzana Jesuítica (Jesuit Block), is like a tour of the history not just of Córdoba but the whole country. This UNESCO World Heritage Site is where the eponymous Catholic order had its local headquarters and founded Argentina’s first university. It’s a big reason why Córdoba came by such nicknames as “La Docta” (“The Learned”) and “city of the bells”. 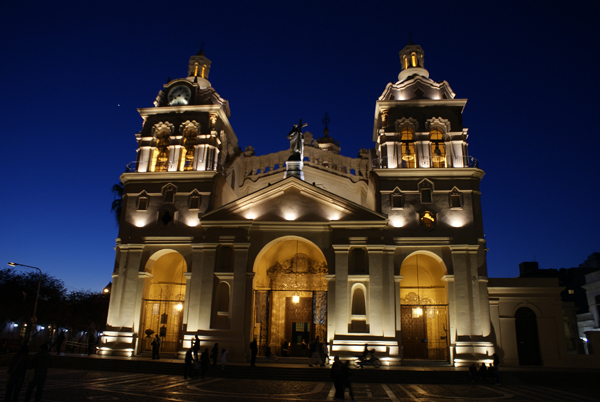 The imposing cathedral, with a neo-Romanesque dome and a lavish interior, is another must, as is the Santa Catalina Monastery, separated from the Cabildo (colonial-era town hall, home to the city history museum) by a magnificent ochre-and-white passageway. The nearby university (est. 1613) is worth a visit, as well, for its architecture and its rich, tome-filled library. The fortresslike Jesuit Church of the Company of Jesus here is Argentina’s oldest church, completed in 1671. Take a break in the breezy courtyard of the Colegio Nacional de Monserrat, a Jesuit secondary school found in 1687, amid the plants, marble fountain, and allegorical statues. Afterward, pop over to the Museo Emilio Caraffa, which in addition to a fine collection of Argentine art puts on numerous temporary exhibitions of paintings, sculpture, multimedia, and installations – it takes a broad view of “art” without getting too “out there”. Then the 18th-century Bishop Mercadillo House and the Santo Domingo Basilica (current incarnation dating from 1861) round out this gorgeous and fascinating historic district. If you’ve got kids with you (and what they heck, even if you don’t), the local zoo is (literally) a hoot, with not just owls and monkeys but Asian elephants, African lions and zebras, Bengal tigers, and all manner of South American and world fauna. It’s located in Parque Sarmiento, in the upper part of the city, which offers the bonus opportunity of a nice little picnic in the grass plus some splendid vistas out over Córdoba. Speaking of outdoor spaces, another not to miss is the rosedal, a delicate, romantic garden. Another nice outing is a stroll is along La Cañada, an iconic creek which comes down from the nearby Sierras Chicas mountains and crosses the city. Nature-lovers will want to get out of town, as well, to fetching surrounding valleys such as Calamuchita, Punilla and Traslasierra. When it comes to dining and shopping, Córdoba doesn’t disappoint. You’ll especially want to get over to the Güemes neighbourhood, where most of the hot restaurants are located, as well as art galleries and studios, boutiques and antiques shops – you know, hipster central. After dark, head to Calle Chateau Carreras, a street lined with the best nightspots in town. More information: Argentina Tourism Board. Best fares from the U.K., from Spain.